Hot on the heels of the latest Apple TV announcement, Google has finally revealed features and details about Google TV in the mini-site http://google.com/tv. Google TV and the likes aim to provide us with a seamless Internet on TV experience – a browser, integrated TV & web search, easy access to online media content, etc. Google TV apps – comes loaded with apps for Netflix, Pandora, Twitter, CNBC, Amazon Video on Demand, NBA Game Time, etc. Phone as Remote – use your Android phone as a remote control for Google TV. iOS app rumored to come as well. TV Homepage – Add your favorite shows, channels, apps to your TV homepage for easy access to stuff. Over the air updates – No need to plug in usb or anything to update. How do I Get Google TV? Google TV is going to available in Smart TVs this fall with HDTVs with built-in Google TV technology. Or you can purchase a set top Google TV box to use it with your current TV. The first of the Google TV boxes is Logitech Revue. There is no availability date except that it will be this fall. You can read a short FAQ on it here. I overheard on Twitter that the price of this box be about $200 which is $100 more than Apple TV and a bit over my budget at the moment. if you are interested in Google TV, this CrunchGear article is an interesting article and asked a few questions I had myself about it. 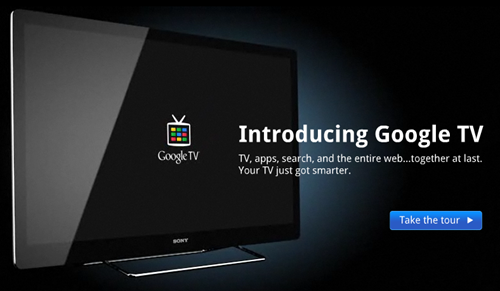 So, is Google TV what you imagined it will be? I am really excited at the future of television and can’t wait to get my cable cancelled. But I am going to hold off for some more time until this web on tv scene gets a bit more mature.